Lee Ann was, as you might remember, going to post about a very important Memorial Day event for her - the re-dedicating of their local library into a 'memorial' library - to commemorate the war dead, including her son Thomas, who died in Iraq. the re-dedication was this weekend...and, she'd still going to write something soon, but it seems the weekend was sort of overwhelming with family and unexpected events (her too! - sound familiar?) that she hasn't been able to put pen to paper and give it the time and thought it deserves. So I told her not to worry and to just send it when she's ready. My day was beautifully quiet, except for the regular Monday avalanche of emails - even more as we head into the launch of Bury Your DEad and try to coordinate tour schedules. And we're booking into next year as well. Events always sound like a good idea when they're 12 months away.,..and then as they get closer I scratch my head and try to think why I ever thought that was a good idea. So, am trying to be more respectful of my writing schedule and not encroach too much into next winter and early spring. However, it looks as though I have managed to book an event in Pittsburgh next April. Will keep you posted. Writing/editing going well. More of a re-write than an edit, as I adjust scenes, and characters...and even names. My first drafts and final drafts are often unrecognizable as the same book. Exciting news...as some of you know, I've been thinking of getting a new car. We sold both of ours in the winter, with the thought of simplifying. going, perhaps, with only one. N ow that seems not very workable. Being in the middle of the country, with touring, I can't just take our one car and leave Michael and Trudy marooned. Well, I could, but I probably couldn't come back. but we hate the thought of two cars. Until we realized if we got one with low gas consumption and used it everyday it would make more environmental sense. At first I was thinking of a Smart Car...I just adore the design. But the more we thought about it the more restrictive it seemed. Wouldn't want to drive it in winter. Or on our highways. But our friend and neighbor, Walter, has had a series of new beetle convertibles and swears by them. Indeed, my very first car was a VW Rabbit convertible. I adored it. so, we got to thinking about that...and then I saw a powder blue one...VW beetle convertible. 2006. The only year they made powder blue, apparently. and we wanted a used one...for the country roads, seemed to make more sense. We've looked and looked. Walter's looked for us. I've made phone calls, followed them up...but nothing. Can't remember when I've been more excited about a car...except, perhaps, that very first one, thirty years ago. Wow. Hope you're enjoying the long memorial day weekend. we've been so moved by the coverage, by the interviews. On all the wars and all the lost. We can smell the smoke from the forest fires way up in Northern Quebec, so huge are they. Disconcerting. Not because we're in any danger, but just knowing how much is being destroyed. And the threat to people's homes and way of life - most of whom are native. Terrible. Apparently the burning can be smelt as far south as Maine. Very frightening for the people. I remember well the wild fires in Australia a year ago. Had a fun board meeting this morning, organizing the SPCA tea. Going to be a great event. Spent the rest of the day editing nd writing...until seven pm. Then made dinner. Writing/editing going well but much slower than I expectd. The first draft is close to right - but not quite...so to get it right I actually have to do alot of writing. i'm enjoying it, and very pleased with how the second draft is reading. But wow is it a hard slog. Still, the job now is to get it right. Quality, not quantity, I keep reminding myself. Even if this draft takes until August, if I get it right it's much better than being finished in June, but needing yet another severe re-write. Feel like the blog is dull - not much energy or creativity left by the time I blog these days. Sorry! But I do think of you. Lovely, quiet day tomorrow. Just writing. Yay. Still a nice day...watered the annuals in the pots that Lise planted a few days ago. She also asked us to water the broccoli. All watered. Then it started to rain. But not for long. We actually haven't had rain for a couple weeks...now everything's really dry. the second draft is going slowly - but well. As I mentioned earlier, the beginning is always the most labour intensive, always needs the most work...but I think the big re-direction is done and now it's more fine tuning. Or not. We'll see. I feel I can now set a goal. The manuscript is 264 pages, single spaced. I'm on page 20. I'm hoping to get to page 100 by Friday. And then 100 pages a week after that. At that rate I might be finished by about June 20th. So that's the goal...allowing for some days away to do events...I'll be in Orangeville, Ontario next weekend for the culmination of the One Book, One County events, at the Grace Tipling hall in Shelburne. So that'll be a few days away for travel and the event...and other things. Meeting friends for coffee today at the Cafe International in sutton. Tomorrow morning we're hosting the board meeting for the SPCA tea. Michael and I have agreed to host the big fundraising event this summer. It's a tea at our home, outside in the garden. Last Saturday of July. So there's an organizing meeting here tomorrow morning. God bless, Lise...she said she'd come and help out. We have to decide where the tents should go. Of course, as we walked the property earlier and I'm making suggestions, Lise, always patient, listened, then gently pointed out that if they put the tents where I suggested they'd all be underwater if it rained. I chose the low land. Tomorrow should be fun, as we have coffee, muffins, and ten of us walk the garden deciding what to put where. Well, we suggest and Lise decides. Then more writing. Feels good to breakthrough to a point where I feel it's fair on myself to set a goal and goal-posts. Have noticed, yet again, that the letters on the keyboard of my old laptop have worn off. Just little flecks of white are left. Every now and then as I write I forget where the 'h' is, or the 'p'. And then I have to hit keys at random. So words come out like 'larty' - 'oarty' - 'tarty'...and finally - 'party'. So, if Peter and Clara suddenly have a tarty gathering you can guess what happened. I'll let you know how the meeting tomorrow morning goes. this is the Memorial Day long weekend in the US...the time when there are tributes to men and women in uniform. yesterday was also the day when the Library in Lee Ann's neighborhood was renamed...a 'memorial library',,,it's a campaign that first brought Lee Ann and I together, when Still Life first came out and a specific quote moved her to write me. We've been in contact ever since. At the time her son Thomas had recently been killed in Iraq. And she'd started the campaign to have the library re-named a 'memorial libary' - in memory of all the men and women who have died. Years and years she and others in her community have fought, argued, asked, begged, cajoled. And finally, it has happened. I've asked Lee Ann to blog about the experience on Monday. I just wanted you to know. Another gorgeous day. Gad - how long will this torment last?? Writing went much better today. We started with breakfast out - as a treat - then back home by 9am and at work until 3pm without breaks except to walk Trudy around the pond. Unspeakably beautiful out there. I think the new idea has worked...what a relief. got tired at the end and sort of did a short-hand end to this scene. but will read it all over tomorrow morning and see what I think. It's important at this stage that each word have a reason to be there, and if possible each scene and conversation serve several purposes, propelling both the plot and deepening the characters. I think this new approach has worked. Wow, what a relief. Yay. Had a very fun email from Marian Misters of Sleuth of Baker Street in Toronto. At the Arthur Ellis awards in Toronto last night, The Brutal Telling won the Sleuth award for the best selling Canadian mystery of 2009! Thank you for all your supportive comments after yesterday's post. It helps! Cold snap...now we're just five degrees above normal. Another beautiful day. Michael swam and I was about to, but other things popped up, so didn't. Spent most of the day editing...then realized it was wrong. I just wasn't happy with it. So I read the original version, from the first draft...and there were some sections - turns of phrases really - I liked. But even then it didn't gel. It was OK - perhaps even good. But not perfect. I know when it's bang on. I just feel it. And this scene isn't. It's quite early in the book and quite complex and needs to be done with a light hand, which means getting the POV right, the dialogue right, the small strokes filling in character needs to be invisible...to happen so naturally you don't even realize. But the character just fills out. So I went for a walk. And sat on a bench. And imagined the scene. This way. That way. I saw it, and followed it. And all hit a wall. Then, as I showered and was thinking of it - an idea came. A POV that hadn't occured to me before...but might also solve another issue. I'm quite excited about it. Right now I don't want to over-think it...it just feels right now. So I want to approach it fresh tomorrow morning. I know if this doesn't work something eventually will. I worry, but I don't panic. It's more of a pain...to work so hard and know it still isn't right...but I also know all this is necessary, before I can get it right. But it's much more fun when I get it right the first time! Or the second. Oddly, when it's a real pain, and I fight and fight - it feels even better when the solution presents itself. And I know the book is even better for the struggle. It forces me to go to places I might have been resisting. To see things in myself I didn't want to see - and needed to put on the page. But most of the time, it's about being more subtle. Sometimes it's easy. Sometimes it's just really hard. But it's always worth the effort. Cause when I finally get it right...whoooppeee!!! Joy. Another stunner. Gorgeous. Spent the morning on the screen porch, writing. I wish I could say I was editing, but the truth is, I'm doing mostly original writing...doing new scenes at the beginning of the book. But I really like what I'm doing, and don't feel at all badly that all the writing I did months ago to start the book will never be read...will in fact disappear. Because I know two things....what I'm doing now is better. And I needed to write what I did before to be able to write this. It's all a process...building on itself. And the beginning of my books are almost always going to need re-writing because when I start a book the themes and direction are never as clear as when I finish. So the second draft is done from a whole different perspective. I'm actually very excited about this stage...not at all afraid anymore, even though it looks as though the editing is really more of a second draft than an edit. And will almost certainly take longer than expected. But I'm now hoping to have this draft finished by the beginning of July. We're going to NY for a few days early in the month to celebrate a friend's birthday so I'm aiming to have it done then. Lovely life. To sit on the porch, looking over the gardens, and writing about Three Pines, about Clara and Ruth and Gamache. when I'd finished for the day I took Trudy for a walk - and found that the lupins by the pond were out. Did I mention that a duck is nesting on the island? Trudy and I scared it by mistake a few days ago and it flew away...then I worried it wouldn't come back - but I didn't want to check, and scare it again. But Victor and Michael reported it was back. So we're expecting a brood of ducklings any day now. My Assistant Lise dropped by with the flats of annuals. She'll put them in tomorrow. And Kirk came by with a suggestion for a wall colour for the Montreal apartment. Nice, nice day. I feel at peace. Gorgeous day. slight breeze - brushing away most of the black flies. Started with breakfast in Cowansville. Then home to start the second draft of book 7. There are two terrifying days in my writers calendar. The first day of the first draft...I hate first drafts. Very scary. And the first day of the second draft - or the first edit. that's today. I love editing, but the first day is terrifying because I've just spent 3 months fighting to keep the big, fat, stinky critic at bay. Behind the bulging door. And now I have to let it out. I need the critical eye and thoughts for the editing. But by now the critic has grown mighty bitter and pissed-off and full of bile. It's just mean. And it's in the room with me. Venting. Screaming that I've just wasted 3 months. That the entire first draft is the worst pile of skunk poop ever dropped. That the characters are cardboard, the story confusing, the conclusion cliched. and, while we're at it, I'm fat and stupid and ugly. And, are you really going to wear that??? You can see why the first day of editing is pretty gruesome. As it approached I kept reminding myself to stay in the day, in the moment. Don't think ahead. Just write down ideas as they came and don't listen to the critic warming up in the background. As I went for walks I tried to open my mind for inspiration, and ask for help and guidance, and courage. this morning, the first day of editing, I lay in bed and opened emails...and there was a message from a woman I hadn't seen or spoken to in 40 years. In her long email she was describing a mutual acquaintance...and her description was exactly what I was trying to do with the book. I wrote her back and thanked her - and asked if she minded if I used some of what she wrote as inspiration. And she said not at all. It was so strange. Like waking up to an email from the gods of inspiration. It was thrilling. As I read her message so much of what I had to do became clear. Often it's just a turn of phrase...as it was in this case. So I sat down and re-wrote the whole first chapter. Using what I already had as a base...but coming at it from a different angle. It feels right and good - and calming. The first day is always the hardest. But when it was over Michael and I celebrated with our first swim of the season in the pool. The kids swam all weekend - the temperature in the pool was 70! Since the forecast was for continued hot weather through the week we put the heat pump on and it's now in the low 80's. Back to editing tomorrow. It gets progressively easier. And more exciting, as the fear slips away. Another beautiful day! Sunny and hot. Had coffee this morning with a friend in Sutton. the family left at 5 this morning. Michael and I set our alarm for 4:15. Woke Doug up...he did the last minute packing of the car then woke the kids. Four bleary zombies clomped downstairs, gave us hugs and kisses (they could have been kissing a chair as far as they were concerned)...then into the car. Actually, to be fair, most did manage a few full sentences. And were very gracious. And back to bed we went. Just got emails from Theo's mom to say he's home and to thank us...but I have to say, he's a remarkable young man...boy. Hard to say at 12. He sat down at the piano and started playing, so I asked about music lessons and he said he doesn't play piano but something else (have just forgotten which instrument he said)...I asked how in the world he picked out Mozart, and he explained he plays it on his other instrument so figured it out. He cleared the table, and even washed his dishes. Some smart mother should get dibs on him in about 10 years for her daughter. He's also a funny and kind boy. A great friend for Charlie, who is all those things as well. Also had an email from Doug, confirming they're home. Always a relief to hear that. Have a quiet afternoon...might try to do the first draft of the June newsletter. I think the Canadiens are playing tonight - have sort of lost track. It would be the make or break game. Tomorrow having breakfast in cowansville then some banking, then home for....arrrgh....the beginning of the first edit, or second draft, of the next book. Very scary. Will tell you tomorrow what happens. Having a great time with the kids. I'm not at all good with kids until they hit the double digits, and then I'm more relaxed. Once I can talk to them. And these kids are great. Two boys, two girls...so far no tears, no teasing, no taunting and meanness that come sometimes happen. Of course, the day isn't over yet... But yesterday was a joy. Rained a bit in the morning, but they all went swimming anyway. I've forgotten what it's like to be a kid and not care about water temperature. They even went swimming for an hour or so in the pond. They found the big pool toys...the dolphin and the porpoise - and next thing we knew they were splashing away with Uncle Doug in the pond. Today, after pancakes and bacon the boys got back in the pool and devised the 'Kids Olympics" which entailed catching a football as you jump into the deep end, then running along the bottom of the shallow end, and finally their version of the butterfly. Pretty chaotic Olympics, but still no tears and no trips to the emergency department. Barbeque burgers for the kids, lobsters for Vic and Michael - salads for Doug and me. Ending with the brownies, which Theo's Mom made...dear Lord they're wonderful. And today is just the most beautiful day. As I write all four kids have just finished playing soccer out by the pond and are now in the pool. We're off for crepes later, but will hang loose (as they say) in case the kids would rather just play around here. sirloin steaks on the BBQ for dinner - and salads. Frankly, while we try to get some good food into the kids we pretty much feed them crap...and hope Theo's mom put carrots and broccoli into the brownies. Like the Canadiens winning this series, it seems a forlorn hope. It's a little disconcerting when Markus is getting better nutrition than the kids. Everyone leaves tomorrow morning, we have the the Adult Olympics of washing sheets and towels and doing dishes and finding single shoes and socks and underwear to be mailed after them. And then the place gets quiet, and we try to pretend it's peaceful...just peaceful. And not empty. 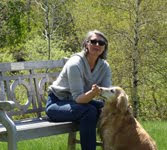 As I write, Michael and I are sitting in the screen porch sipping ice tea and looking across the pool, past the perennial garden and the parkland to the pond beyond. The water at the pond is calm, like glass. Wayne and Shirley came yesterday and cut the grass...and while Wayne finished off Shirley and their new puppy Twinkle (from Animatch) joined Trudy and me on the porch for a lemonade. Right now we can hear only birds in the background, the hum of hundreds of bumble bees in the sage and honeysuckle and lilac, and the lapping of the water in the pool. Just heard the Oh Canada bird. I looked it up last summer, trying to find the real name. Michael finally found it by consulting an audio guide to North American birds. I was upstairs working and confused by what sounded like a sudden menagerie in the kitchen. It was Michael, going through the birds on tape, one by one. He finally found the Oh Canada Bird, but now, of course, we've forgotten it's real name again. From here I can see the crab apple by the pool in full and spectacular bloom, as you pointed out yesterday. Did you see the Canadien's game last night? 5 to 1!!! For us. Very exciting...but we didn't exhale until the final buzzer...Philly is just that good, and determined. Next game tomorrow at 3pm. Doug and the kids (four of them) and Buttercup Penny - you'll be happy to hear - are arriving tonight, as is Michael's youngest son, Vic. We did a big shop. Planning burgers on the BBQ tomorrow night after the game, and steak sunday night. Might take the kids in to Knowlton Sunday for crepes - they love real Quebec crepes - and some shopping. The girls are 14 and love shopping. The boys are 12 and don't - but young enough to bribe, I figure. Give Doug and Vic and Michael some quiet time. It was so great to see you and Donna yesterday....and all the time and effort you've put into the garden is so worth it. They've never been lovelier. The just purr with pleasure when the two of you are working on them. And next week the annuals go in!! Always a sign of summer. More lilac in vases - kitchen fairly reeks of lilac - and putting small vases in each bedroom. Thank you, My Assistant Lise, for this glorious garden. And for giving Michael and me Paradise. unexpectedly lovely day. They were calling for rain, so this is a gift. Wayne is cutting the lawn. Lise and Donna came this morning and weeded - and planted vegetables. three types of peas, scarlet runner beans - and next week the broccoli will go in. Wanted Potatoes but they'd attract potato beetles, that will eat the lilies. So - no potatoes. Did three big loads of laundry - including bedding. Tomorrow 'le deluge' - Michael's son Vic, my brother Doug and two of his kids and two of their friends will arrive. So we've been getting ready. Not sure anything ever is 'ready' for the onslaught. But it sure is fun...trying to figure out where to sleep everyone. Fortunately the sofa on the screen porch coverts to a bed and Roslyn loves sleeping out there...we pile her under a bunch of duvets and leave the doors to the house open in case it rains or gets cold or she get scared. But every morning she's still out there, sound asleep. We always manage to find beds for everyone. Busier day than expected...had to try to decipher the tax exemption forms from the tax people in France. I could feel my life-force being drained from me as I read it. But after a few hours, and a few phone calls to our tax people in Ottawa, and our accountant, I think I've figured out what they want. Either way, I'm mailing it! The laundry is fun - two loads have been hung on the clothes line...our sheets. Love pinning up the laundry, and taking it down, with the fresh scent and sheets warmed by the sun. Then I cut a few bunches of lilac and put them in vases around the home. Black flies have arrived! Thank god for the screen porch. Next week I'll start the second draft (first edit) of the next book. I'm sure enjoying these two weeks away from the book...but I'm also looking forward to getting back. I say that now, but I can guarantee on Sunday I won't be feeling quite so enthusiastic. Breakfast tomorrow with Joan. It has been so wonderful to catch up with friends these past two weeks. Cool and rainy - but good for the garden, and it's the day we left Hovey anyway so we really don't mind the rain. Lilac almost out here at home. Even got the suitcase unpacked! I often can live out of it for a week - too lazy to totally unpack...so I do it in stages. Funny how easy it is to unpack at the hotel, but so hard to do it at home. I timed myself today. Took 7 minutes. And yet I can stretch it out for a week. And lovely of Ralph Cosham to blog for us. What a wonderful post too. Thank you, Ralph. On another topic, les Canadiens have so far lost both of their hockey games against Philadelphia. The first was 6 to 0! the second, last night, was 3-0. So we're getting better. I figure, at the rate they're going, they'll tie the next game, 0-0. Then win the next 3-0, etc. So, basically, the Habs have Philly just where we want 'em. What a plan. Hoping to have another quiet day tomorrow and start getting ready for everyone arriving this weekend. Speak to you tomorrow! A spectacular early summer day. Hard to believe a week ago it was still snowing! And this morning, after breakfast at Hovey, Michael and I did one of our favorite things...we sat in the adirondack chairs on the lawn in the gardens, looking out at the lake, sipping coffee, reading the newspaper, and smelling lilac for the first time this year. Just a soft hint of lilac in the warm air. Growing up in the austerity of post-World War Two England, books and the radio were my means of escape and the foundation of my love of language, reinforced and intensified by many years as a journalist and actor. 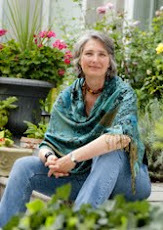 In my opinion, Louise Penny is a great mystery writer in the tradition of Ngaio Marsh and Josephine Tey, and much of the credit for whatever success I may have had in creating the audio versions of the Three Pines mysteries is due to Louise herself. She created such vivid images in my mind that I feel that I know Three Pines and its inhabitants and I try to translate those images into an audio version that will give listeners the same level of enjoyment that her readers get. As for Gamache, he has become very special to me. To me, it is as though Roderick Alleyn and Inspector Maigret had a son: all British intellect and Gallic charm, with a dash of that understated (and often underestimated) Canadian competence. The most frequently asked question I get when people find out I narrate audiobooks is whether I read the books in advance. I do not. There usually isn’t time. I will skip ahead a few pages to see if there are any words I need to look up for meaning or pronunciation, or to look for clues as to the origin of a new character. I’ve done this ever since I discovered, 10 pages after he was introduced, that a character’s “Scottish brogue became more pronounced!” What I try to do is create the feeling that the listener and I are discovering the book at the same time. I am thrilled that I will be continuing to narrate the Three Pines mysteries, and I cannot wait to get my hands on the manuscript of Bury Your Dead. Doesn't Ralph sound just wonderful? I'm looking forward to meeting him. Indeed, the publishers of the audio book are looking into organizing some events for the two of us, so we can share a stage and discuss what each of us does to bring the books and characters and settings alive. That would be great fun. I'll let you know if anything comes of that. And, since this is such a lovely post, I've decided to leave it up for a couple of days - and put it in the June Newsletter. Speak to you on Wednesday...though I'll be reading your comments, of course - as will Ralph, I believe. Lovely, lovely fresh day. Not hot, but warm, especially in the sun. Just beautiful. We're at Hovey Manor! Arrived in time for breakfast....on Sunday they do their wonderful breakfasts until 2pm - which is a brilliant idea since lots of non-guests now come for it. Not expensive (at least not as expensive as other meals) - very yummy - and glorious setting. So we determined to leave as soon as Pat and Tony arrived to house-sit and Trudy-sit. Drove the hour and a half over here....arrived at the front desk to see our friend Marc-Andre there. He looked at us, smiled - and then a look of desolation came over him. 'Bonjour,' he said - his smile almost recovered. 'Next week?' I asked with a more than nervous giggle. Since I was the one who'd made the reservations I had reason to be nervous, though not much reason to giggle. What could a gal do? I broke into hysterical laughter. Michael did not. When I stopped we all just stared at each other for a moment. And then I apologized. It was clearly my fault - I must have been looking at the wrong page in my calendar. And next Sunday is a spectacularly ridiculous time to reserve at Hovey since it's in the middle of the Victoria Day (yes, we celebrate Queen Victoria) long weekend and we have family staying up to the gunnels. Marc-Andre decided to check once again. often the tiny rooms at the back aren't taken. Ironic, since in The Murder Stone something similar happens with Gamache and Reine-Marie, and they end up in the tiniest room at the Inn. perfectly happy. But as we have established beyond doubt over the years with this blog, they are far better people than me. Still, to be honest, we'd have been happy with that. Or we could have gone home. As I said to Michael, as Marc Andre checked for a broom closet we could stay in, at least we hadn't flown in from New York or Toronto for this. 'Yes,' agreed Michael, 'that is a relief.' He didn't seem convinced. Was it, I wondered, one of their public bathrooms? The shed? 'Pardon?' I asked, my head reeling. 'A vista suite,' said Marc-Andre - pointing either up the hill overlooking the lake, or to Heaven. turns out, it was heaven. Dear Lord - the only room available, which they gave us at the rate we'd booked for next week (much lower) is one of the best rooms at Hovey. More like a completely renovated cottage. Remember when we arrived in St. Lucia to find they'd given us the Presidential Suite??? Well, this is the same thing. It's spectacular!!! Can you believe it? When I regained consciousness we signed for it fast, before Marc-Andre sobered up. Then went in for breakfast (the room wasn't ready). Michael had the 'suggestion' of the day...an asparagus, brie and smoked salmon omelette, with sausages. I had eggs Benedict and sausages - with rich, strong coffee. then we walked the gardens and onto the dock. Lounged by the pool. And then the room was ready. It's outside the main lodge, on the hill...easy walk to the main building for meals, though they'll also bring them up. I'm sitting on the big wooden verandah looking over the lake...the private hot tub calling to me. Inside it is totally renovated with a sort of mid-century modern feel....huge bedroom with walk-in closet. Huge living room and bathroom. A kitchen! Flat screen TV's everywhere. We're cha-chaing in the lap of luxury!!! Forward our mail. Back in sutton - feels wonderful. Had a quiet day yesterday...did some groceries and mailings. And rented Sherlock Holmes. I've been reluctant to see it because I adored reading the Conan Doyle stories growing up. Read them all - they were very important to me. And I hated the idea of giving them the Hollywood, testosterone treatment. Call it something else, but no Sherlock Holmes. But finally decided to see it and....I loved it. Still don't think of it as Holmes, but it was wonderful. Great chemistry between Robert Downie Jr and Jude Law as Watson. Didn't like the casting of the two women, Irene Adler and Watson's Mary. I thought they were both mis-cast. But, not being a casting agent I might be wrong. There was nothing wrong with the women who played them, but i thought they could have been both stronger and more charming. But the film surprised me by being so good. Had breakfast with Cheryl in Knowlton. Looked at the plans for the home they're building. It's wonderful - very exciting. i love looking at house plans, and especially of people I care about. Off to Hovey Manor tomorrow!!! Three nights. Hovey was the inspiration for the Manoir Bellechasse in A Rule Against Murder/The Murder Stone. Having such fun with these two weeks off...and getting alot of good ideas for the editing. Helps to relieve the stress - a whole lot of things start becoming clearer. Including a new way to start the book. Nothing radically different, but just a slight re-adjustment to the opening scene. the city's still reeling from last night's win. Emotionally - but also some physical clean-up too. Some of the crowds got a little out of hand (hooligans) and broke some store windows. A shame to mar such an amazing hockey win - but for some I guess any excuse to do damage. And high spirits too...hard to remember what it's like to be young, and perhaps drunk, and feeling overcome with excitement. At least they didn't turn on each other. All through the city people were still singing Ole, ole, ole. Canadiens flags out. Business men, students, otherwise elegant Quebecoise women wearing Habs skirts. It's very fun - and funny. Beyond the slight hockey hang-over it actually was a quiet day. Had a massage - always great. Picked up a new cordless phone for home. Our old one seems to be wearing down, and we like to be able to have it on us as we walk around the pond or sit outside. Last night before the game we watched The Damned United - a terrific British film about Leeds United soccer club in the 1970's - and their coach. True story. We really liked it. Today I rented The September Issue - about Anna Wintour and putting together the September Vogue - the huge annual issue. Fascinating. I'm not generally interested in fashion - but I am interested in sub-cultures - and dynamics...and human inter-actions, especially creative people. So this was a feast. Especially rich 'meeting' the remarkable Grace - who styles many of the vogue shoots and photos. Amazing. A person I'd love to personally meet. Can't often say that of the creative people profiled in films like this. They're often riveting messes. But not Grace. She's vulnerable, and strong, self-aware, funny - she was a model until an accident ended her career...and now she's an absolutely brilliant visionary. Her photo shoots are stunning, even to my untrained eye. Wish I could remember her last name. Love learning things. Of course, I always forget the exact facts and details and only really retain impressions. Feelings. Makes a documentary very hard to re-count. As you see, I've already forgotten Grace's last name, and by tomorrow morning I'll have forgotten her first. But I'll remember her long red hair and her vitality and humanity - and the sense of working at Vogue. I think. Michael off for dinner with one of his sons tonight. I bought some sushi and will relax at home, after a great day. Back to Sutton tomorrow. Speak then. Oh my God - we won the game!!!! Almost died watching the third period. The Pens are such a great team and they rallied. Huge party out on the streets of Montreal. Tens of thousands in streets. Riot police out. Yipppeeee. We're snug in bed. I'm no longer sure what's seasonable...but this feels good. We're in Montreal. Had a great breakfast with Tim in Cowansville, then headed in, getting to the car dealership in time - they drove us downtown and I arrived at Victoria Hall in Westmount with time enough to wander the wonderful Westmount library, right next door. Then into the Rotary lunch. They're an impressive lot. Believe strongly in giving back to the community. After lunch it was my turn to speak - I did, for about 20 minutes, then we opened it up for questions. And then it was time to go. Love clubs that are precise...in at 12:15 out by 2pm. Walked home - about 20 minutes...and decided to see about getting my hair cut. I hate having my hair done. I find it boring beyond description - and I realize why. I feel I have to talk to the hairdresser - who is going on and on about something - even as the blow dryer is howling in my ear. So I have to look alert and interested - neither of which I am. I love massages - which take about the same amount of time - because everyone is quiet. then picked up some groceries and headed home. Michael was off for lunch with his good friend David - and then he was picking up a Nespresso maker. We have one in the country and adore it. Our only problem was that there was a lot of garbage, from the little individual capsules. But now the Nespresso store in Mtl is recycling. So we save them up and take them in. And we love the treat of the coffee so much we decided to get one in Montreal. Poor Michael had to lug it home. but now we're in - and all set to watch the Canadiens vs the Penguins in the final game of the series. They're tied at 3 games each. This is 'sudden death'. the city's going crazy, with Habs flags everywhere. I could run naked down Ste-Catherine street at 8 tonight and no one would notice. Very fun atmosphere in Mtl - mostly because no one expected the Habs to get this far - so win or lose, it's great. Tomorrow have one of my rare days with no commitments, appointments, events or writing in Montreal. I wonder what I'll do??? It's turned into a lovely, though chilly, day. Had the predicted hard frost last night. Frost on the car. Quite a shock heading into mid-May! But by 8am it had melted and by noon it was a nice April day. Too bad it's May. But I have to admit such is spring in Canada. You just never know. Which is why we're told time and again not to put our annuals or vegetables into the garden until after the Victoria Day long weekend. That's May 24th. Most years it seems a ridiculous injunction, and then suddenly there's a frost. This year it seems less silly. Hard to access the damage done by the snow and then the hard frost. I'm thinking it's not nearly as bad as I feared. yay! As someone commented, quite rightly, Nature is resilient. Has to be. Otherwise Canada and certainly Quebec would have been a wasteland years ago. Harvested our first asperagus, through the snow. Very funny to see the stalks poking up through the snow. Went to Cowansville for breakfast - did some banking and mailing. Then dropped Michael at home so he could work on his book, and I went across to Richford. More mailing! ahhhh. To - nothing!! Like those school days waking early, getting ready to drag ourselves out of bed, only to realize it's Saturday. Getting caught up on a while lot of things, but none stressful now that I have the time. Thanks SO much for your help finding a place on the Sunshine Coast...we'll be going a few days early, before the Literary Festival in Sechelt and need a place to stay. We'd found the Rockwater Inn (and Spa!!) - but it was booked. But we've now booked into a B and B called A Place by the Sea. Rooms seem huge - decks looking out over the water. Massages....and we've booked a private sea safari - all day, just us and the captain...taking us into the remote waterways of British Columbia. Stopping at a remote beach to walk, or swim and to have a hot lunch cooked on the shore. Sounds divine!!! Have also booked two spa treatments - not on the beach. Though that would be great too. The only thing that seems complex is getting to Sechelt! But apparently people do. We won't be the first. The masseuse, for instance, had to find their way. But that's part of the fun of traveling. We fly in to Vancouver - then somehow get the 20 kilometers from the airport to the ferry. Take the 40 minute ferry (which is apparently spectacular) to the Sunshine Coast. We've booked a rental car there. The rest sound be easy. I find for my peace of mind, I just need to give us plenty of time between the time the flight arrives and our ferry booking. And to remember if we miss the ferry no one is likely to die. or even be maimed. It actually doesn't matter. Michael is much more zen about these things than I am. But then, he can afford to be, he has me to do all the worrying. Next life I'm coming back as a piece of luggage. Lovely to see the sun. On the way back from Richford, VT I stopped at the grocery store and got us a couple steaks for the BBQ tonight. A few nights ago I stopped and noticed it's Lobster Festival! Sutton is landlocked, so not a lot of local lobster, but Canada has a huge east coast lobster industry...so I guess the lobsters have arrived. Michael loves them. I'm not a huge fan. So I went in and got Michael a nice, just cooked, one. I hate the idea of pointing to one in the tank and having them cook it. Feels way too much like passing final judgment. But am hypocritical enough to be happy to buy one already cooked. You should have seen Michael's face when the lobster came through the door. he spent all day waiting for dinner time. And he found every morsel. Just adored it. What fun. Busy day tomorrow. 8 am breakfast back in Cowansville with some friends...10:30 appointment to take the car in in Montreal - noon speaking engagement with the Rotary Club in Montreal. But I should be back at the apartment by 2pm. pat and Tony coming first thing in the morning, with their dogs, to house sit. Such fun to see their two dogs playing with Trudy out by the pond. You can't imagine the wet dog smell from that! Will try to blog tomorrow. Be well! I think maybe the lilac have survived! Not sure about the peony, and we just heard there's a hard frost expected for tonight. Oh well. It's not the worst thing if we go a year without the flowers, just as long as the bushes etc survive. And I think they will. Blackstone Audiobooks • Trade Ed. Blackstone Audiobooks • Library Ed. And - Booklist has named the audio version of The Brutal Telling one of the top ten audio mystery books of the year! Ralph Cosham, who reads the books. Congratulations, Ralph!!! There was a flurry of concerns a week or so ago when it became apparent that there was a problem with the next book. The audio version of BURY YOUR DEAD is being done by another publisher and they'd chosen a different narrator. Everyone objected and they realized that they could not do better than Ralph! I think each audio publisher has their own informal 'stable' of actors, and they thought to go with one of their own...until their heard Ralph. And realized he'd been lauded for his readings of this series, and others. The goal today is to find a place to stay on the Sunshine Coast of BC when we're there for the Sechelt literary festival. While at the fest they look after our accommodation, but Michael and I decided we'd like to go a few days early and explore this gorgeous part of British Columbia. But we can't find a place to stay! I think the fact I like luxury and peace and privacy (and a spa) might be limiting the choices. But might as well try. Worst case, we just stay for a few days in Vancouver - which is also gorgeous. Be well - speak to you tomorrow. Dreadful weather...five inches of heavy wet snow already. Woke up to it - thought I was Rip Van Winkle and had slept through spring, summer and fall. This would be slightly fun and even amusing and cozy, if all the trees weren't in leaf and bud, as well as the flowers. Have been out twice today to whack the bushes - It breaks my heart. The lilac were just about to bloom, and now this. The honeysuckle flowers were juuuust popping. The peony are in bud but were on the ground, buried under heavy snow. All the trees and bushes and bend, the roses and peony and late tupips and last of the daffs are on the ground. And still the snow continues. All I can do is go out every hour or so and try to get the snow off. I put supports around the peony this morning and propped them up. But then I wonder if they're better, more protected, under a blanket of snow. What's worse? The cold wind or the heavy snow? And is it too late already? Funny, last night I was almost sick with joy at the thought of a day (today) with nothing to do. Sit in front of the fire with yesterday's paper and my Maigret book. Read and sip tea. Or coffee. Or ginger ale. Still, people are facing worse days that sweeping snow off the garden. At least we have a garden to sweep. And a fireplace to come in to. And heaven knows, we can't stop the snow. It's mother's Day! I don't have children, except Trudy, of course, who gave me a lovely card she apparently asked Michael to get when he was in New York. It's hilarious. And I thought of my mother this morning, gone now for ten years. But as I woke up and saw the snow I heard her voice...'I could just spit', she used to say. turns out she wasn't the Queen. But she was mine. And she's missed. overcast, windy, rainy = Oh, who cares!!! I finished the first draft!!!! All that light from your candles worked - yay! Thank you. What a relief. But what a long day. Finally finished just before midnight. I was determined to finish yesterday, or bust. Almost busted. I started at 8:30am and without breaks for lunch or dinner (ate beside the laptop) - only to walk Trudy a couple of times - I finished at 11:38pm. The end is often very difficult to write...not only are there loads of red herrings and mis-directions and sub-plots to address, but there's also the issue of how and when everything is revealed. You've invested any amount of time reading the book - spent money - invested emotionally as well, so the end needs to be perfect. Fitting. Believable. Satisfying. Right. So over and over and over I went. The same territory. One thing became clear...one of the subplots needs to go. It's not necessary and it just makes the ending all the more cumbersome. Indeed, a whole lot becomes clear once I reach the end. What is clear is...I've Finished!!!! Well, the first draft, but for me, that's always the hardest. I actually like editing. My first drafts are always messes too...there're a lot of names I need to change, stuff to streamline...everything is much clearer to me now. But I sure wasn't going to sleep until I'd written The End, even if I had to pull a Hamlet and kill em all off...to be resurrected in another edit. I didn't - of course. And I know the end still isn't right, but I trust now that by the time this book gets into your hands it will be as it should be. Perhaps not as everyone would want it, but the book I meant to write. Will now take 2 weeks to de-stress. Though the next day or so, including today, is packed with stuff that's piled up and been left undone. Emails to answer, things to mail, all sorts of details that need attending to. Drove across to Vermont to do a mailing this morning. And realized something, as I waited at the US customs line - I'm very hurt that not once has anyone failed to recognize me from my passport photo. I look like Mussolini, on the meat hook, and the guards always look at it, look at me and wave me through. Damn. Visited Markus briefly today...he's fitting in well, playing with the other horses. Jana is taking great care of him. Just need now to find him his permanent home. We have a home all picked out, with a great rider and terrific woman, but haven't got the okey-dokey from the rescue network. Phew.... I wish I could explain how this feels. A relief...an amazement...trying not to worry that it isn't right yet...I know it will be. Mostly I'm almost sick with excitement at the thought of sitting in front of the fireplace tomorrow, with a newspaper, a book and a cafe au lait....and just reading. What could be better? Wayne came and cut the grass. Tony came to cut down trees broken by the heavy snow. Luc came to fix the satellite television. All by 9:30 - so the quiet day wasn't quite as quiet as all that. But we were thrilled to have everyone working...outside. While we ferreted away inside. Still ferreting. Not quite finished the first draft yet. I'm at the revelation stage - always quiet difficult. All an issue of the progression...the reveal. How best to do it? What is most natural? Clearest? How best to knit together all the elements and still keep it simple, but dramatic. so it doesn't read like a list of suspects and motives. Or a compete re-cap of what we've just read. Taking a break right now from writing...watching BBC World - the British elections. Fascinating. Watched it last night too - but got bored. Taking so long to get results. Fun to see that when a riding is called all the candidates are on the stage together with a big coloured ribbon attached to their shoulders. The winner of announced, and the others needed to stand there and applaud. Actually, quiet moving to see such civility - or at least the appearance of it. Need to relax for a few minutes then head back. Am determined to finish today, even if I have to write to midnight! Can always tidy it up in the edit. overcast, rain, hail, sun, rain, hail, sun - temps, who knows! One of those unsettled, dramatic days that swung from beautiful sunny and warm to violent winds and hail. And, of course, it chose to pour just as we needed to be outside. Took Trudy for a walk - approached the pond and suddenly there was thunder and lightning. So Trudy and I skiddadled back home. Poor Michael was out back cutting daffodils for Nancy and George when the storm arrived. He scooted back inside too. We've had dogs - Bonnie in particular - who were terrified of thunder storms. Trudy doesn't seem to care at all, which makes all our lives easier. We set the alarm for 6, as I mentioned yesterday - got up and were writing by 8am...in front of the fire. Fun to see Michael getting back to his book with real vigor...as he does everything. And I think I might finish my first draft tomorrow. Nothing at all on the agenda tomorrow - except to write...yay!!! When we were in Washington, at the Malice Domestic, I was chatting with some other writers and heard a phrase I'm not sure I'd heard before. But it sure is true. The Muddle in the Middle. Now, I never thought I was the only writer who got all kinda confused in the middle of writing my books - I'd heard lots of other writers describe exactly the same phenomenon. But I'd never actually heard that perfect description! The Muddle in the Middle. As you see, I feel it should be capitalized. Perfect. And, as a middle child, I can attest to the fact it's true for more than just a book. At about noon we headed out (through the storm) to Knowlton. I had a bookclub meeting in Boerne, Texas, via Skype. but, having done skype from home we realized our internet is too slow to support it well...so we needed to find another way to do it. and we thought of Nancy, who has high speed and is a computer whiz. Unfortunately I'd raced back from the pond with Trudy so fast, and then we were late, so I jumped in the car and forgot I was still wearing my rubber boots. So the boots got to come with us to Nancy's, to the bookclub, to lunch later with Cotton. To Danny and Lucy's bookstore. We're home now - organizing our trip to New York City in July...need to work ahead to fit events and interviews and meetings together. Pretty fun, I have to say. I haven't yet reached the stage where flying for parties, interivews, and meals and meetings around my books is 'old hat'. It still gives me a thrill to realize I'm talking about myself, and haven't simply made it up. Looking forward to writing tomorrow...fingers crossed I finish. That would be good. Oh, over lunch, Cotton mentioned that there's snow in the forecast for Sunday!! We're back in Sutton. How wonderful this feels. The windows are wide open, doors to the screen porch wide open. Sat outside looking at the garden and pool and pond for half an hour. Just decompressing, and saying my quiet thanks, and letting all the great good fortune sink in. And eat fig newtons. Had fun last night. Michael and I went to a lecture put on by the Council on Palliative Care at McGill - organized by our friend Kappy Flanders. The speaker was Dr. Kathleen Foley, who specializes in the care of the dying. The issue was fascinating - something that's being hotly debated in Quebec right now, and that's physician assisted suicide. Very emotional, of course. Then, after the lecture Kappy held a private buffet dinner at a local club. Very fun - but the most wonderful, and humorous part was when a young a capella group from the McGill music faculty. The student introduced them by saying how much they enjoying singing for people 'Not very young.' There was a long pause and then the place cracked up. She was right, we weren't very young. But we were mighty happy. As were they - the group. Fabulous. Oddly, one of the songs I've been listening to a lot as I write this book is Alicia Keys, 'Falling'. The a capella group sang three songs and one was 'Falling'. They did a great job too. Then home. Past crowds of disappointed Montreal Canadiens fans...we lost 2 to 0 against Pittsburgh. The city is Habs mad. People driving around with flags attached to their cars. Even Kappy - who at the lecture was wearing a lovely dress, changed into a Mtl Canadian captains jersey! At our apartment building on the notice board there is only one notice - a large sign that says, Go Habs Go. Up early today...Michael had an 8am dentist appointment. I packed up, loaded the car then drove to the dentist to pick him up. off to Nicks for breakfast - then to the UPS office to mail a box to the US publisher. Then home (stopping for Trudy's food on the way). Got home by 11:30. Annick, from the Quebec magazine Vita, was coming at noon for lunch and to do an interview. Michael hopped off to the store, while I unpacked. The tulips are up in the cutting garden and divine, so I cut a few vases full. How gorgeous they are. All different varieties and colours. Michael cooked burgers on the barbeque and we ate burgers, salad and sugar pie on the porch. Such a beautiful day. And thrilling to do my first interview for a french magazine, in anticipation of the books coming out in french this summer. After Annick left I had a 4pm interview with Chateleine. They're putting together an article on great summer reads. They wanted to know which mystery I'd recommend. I don't want to ruin the surprise so I'll only say this - my recommendation is Josephine Tey's The Franchise Affair. Have to set the alarm early tomorrow - up by 6am and writing by 8. Then off to Knowlton to Nancy's place. doing a book club in texas by skype at 1pm and Nancy's going to help set us up. Then lunch with Cotton at 1:30. And Friday??? Ahhh - empty. Nothing. Just us, quiet. Writing. And fig newtons. Phew...what a whirlwind. Amazing, fun, breath-taking. Yippiiiee. The phone and messages haven't stopped all day. I still have more than 100 emails to respond to. Not totally certain I'll get to them all. Thank you, each and everyone, for your support, your celelbrations, your joy and your company. Your wanting me to win, but not caring if I didn't. Did interviews today with 2 CBC Radio Shows...there're articles on CBC.ca and The Globe and Mail. Had to turn down a French interview because I was feeling so frazzled I knew I'd just butcher it...but I invited the reporter down to Sutton and said we could talk there, where it's more peaceful. Have an interview on Wednesday at noon with Vita Magazine - the French version of More. And then at 4pm with Chatelaine - which is a big Canadian women's magazine. It's actually a bit like running full blast and hitting a wall. Deeply unexpected. A little stunning. Oddly bruising. But also - to get away from the wall analogy - very, very wonderful. It gets a little confused because I'm also fighting to finish book 7 - and being away for so long (at least it feels like that) it took all day just re-reading and editing the previous two chapters to feel I was in anyway 'back' there in Three Pines with Gamache. And then the phone would ring...or there'd be an urgent email about an interivew or a photograph. Oh...I need to get a couple photos from the event...of just me and the Agatha. Michael took a few but other people - especially the glorious Hank Phillippi Ryan who won for BEst Short Story, were in his shots. In fact, that's one of the photos also on the facebook page. But if any of you were there and have a photo of just me, me, me holding the Agatha teapot, I'd appreciate a copy. I got absolutely no new writing done today - but I think I'm almost back to where I should be in terms of head-space. Having said that - I know this may never, every happen again and I need to really savour it...and I am. thank you again for all your kind words and encouragement!!! Trip home was easy - short US air flight to Burlington. The only hitch was at the Phillipsburg border crossing back into Canada. Only two customs lanes open. Huge long line. I, of course, got into the slow one. And I mean SLOW. But we cleared eventually. got to the Montreal apartment...ordered pizza - and exhaled. Phew... that I think is always the best part...getting back quietly and being able to just slip into PJs, eat pizza, and smile. Tomorrow Michael takes the car in - winter tired finally off...while I write. Then we have a Palliative Care talk late in the afternoon followed by a buffet supper with the organizor, a friend named Kappy Flanders. We have friends with interesting names. Kappy. cotton. Wilder. susan. Well, her name is fine, it's the woman who's strange. Will try to speak to you tomorrow. Be well - and thanks for the company. Who cares what the weather is - I WON!!!! Nothing subtle about me.... yay! I woke up with a sore face from smiling, and laughing and just being absolutely joyous. the whole evening was magical. Michael and I hosted a table with eight really nice people - gave them all hardcover copies of a fatal grace, handmade chocolates from Muriel, in Sutton, and a perpetual calendar - one of the new ones Lise designed. Ordered a couple bottles of wine for the table and settled in for a nice evening. Rhys Bowen was hilarious and moving and gracious as the master of ceremonies. And then the awards...the Best Novel is at the very end. One of the great tragedies in the Malice Domestic community in the past year was the death of one of it's long time directors, and a personal friend of mine - Louise Leftwich. Her brother and sister were invited to speak about her. And then her brother and sister-in-law were asked to give out the awards. It was simple and dignified and lovely and deeply moving. When he read our names we all were asked to stand. Donna Andrews, Lorna Barrett, Rhys Bowen, me, and Hank Phillippi Ryan. And then she read the winner....The Brutal Telling. I was frankly shocked. I totally expected Rhys to win. Indeed, all the novels were terrific and anyone could have won...but I really thought Rhys's was outstanding. But then they called The Brutal Telling. I remember bringing my hands to my face, covering it. Almost wanting to hide. Not out of fear - but a surfeit of delight. I didn't want that moment to end. But I eventually dropped my hands, and went to the front, veering slightly to hug Rhys, who whispered 'Congratulations'...and gave me a huge smile. then up to the podium. And what terrible joy to give Louise Leftwich's brother and sister-in-law a hug and kiss. And then to stand at the podium and look out at 500 people, smiling. This is my home - my family - with people who celebrate each other...and have been so kind to me. Oh, I need to say too, that it was an astonishing evening for Canadians...how inclusive and generous the americans are!!! They'd give two awards to Canadians...and so embrace us. The terrific Alan Bradley won for The Sweetness at the Bottom of the Pie. Mostly, while up there talking, I wanted to thank Michael...for always telling me I was beautiful and brilliant, and loved. No matter what. And I believed him. And I wanted to thank all the people at Malice for embracing not just me, but him too. Off home later today. What a trip! Thanks for coming along. We didn't see much (anything) of Washington - but it's a trip I'll never forget! And - to add to the amazement and the generosity of the community - this is the first time in history an author has won three Agathas for Best Novel in a row! And i'm here to tell you - it never gets tiring!!! Did I mention I won the Agatha!!!! !